So, suppose it’s the morning after Thanksgiving, and you spent about 6 hours on your feet yesterday, cooking. Wouldn’t it be nice to have a hearty, healthy, creamy and delicious breakfast at the ready, with no cooking required? 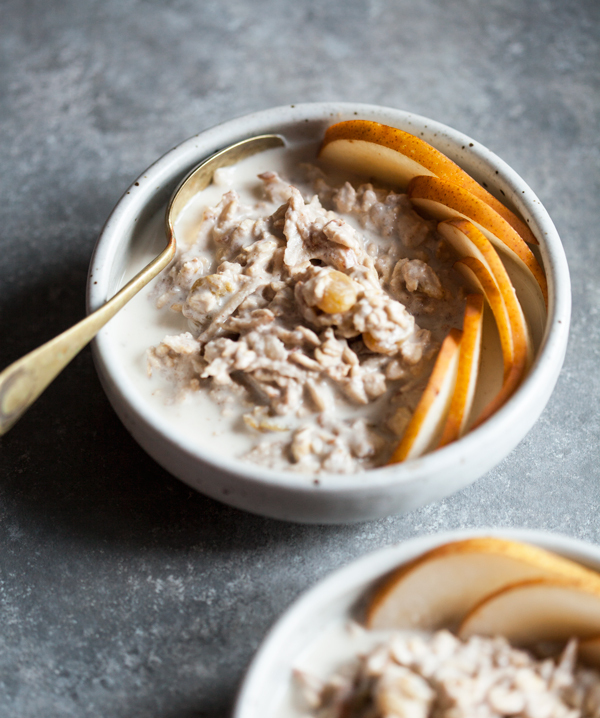 This ginger pear muesli, which is soaked in a creamy cashew milk, is your answer. 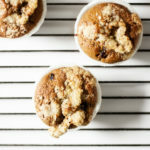 It’s an ideal make ahead breakfast to spare you extra work after the holidays–and really, it’s a great make ahead option for any day on which you’d like one less thing to think about. I’ve experimented with a lot of different muesli recipes. Hot oats are my favorite to be sure, but I have a soft spot for soaked oats, or muesli, too. I first experienced muesli while visiting my great aunt in Oftrigen, Switzerland, when I was about eight. I marveled at how thick and rich the dish was — nothing like the cereal and milk combinations I was used to. 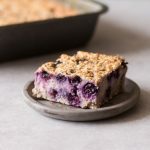 I loved the creamy texture and the surprising bits of fruit and nuts and seeds, and I would eagerly wake up each morning to see if she’d put a different type of fruit on top. 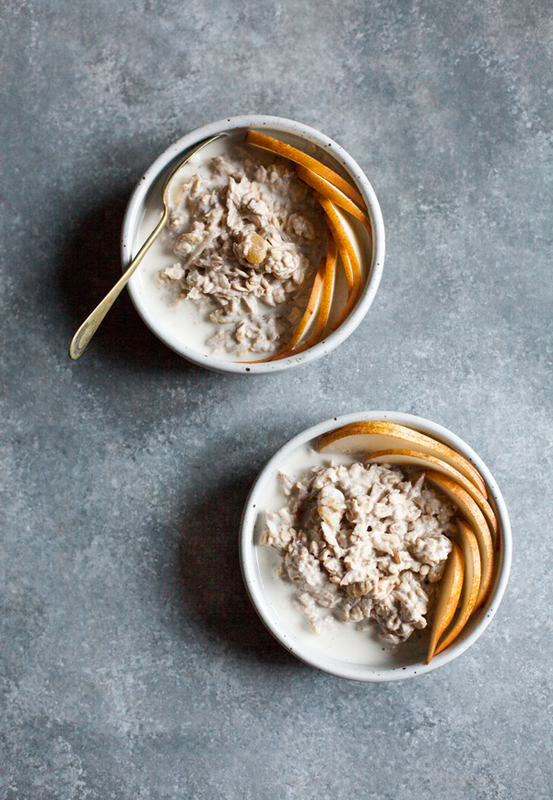 This bowl features a wintery combination of sliced and grated pear, ginger, and cinnamon, in addition to a base of rolled oats and chia seeds. It’s exceptionally thick, which is all thanks to the use of cashew milk. Yogurt is traditionally used as a base or an addition to muesli, which is what gives it the creamy effect (more so than if milk alone were used). Cashew milk is a great substitute, and the recipe I use for this muesli is super simple (no straining required!). You can definitely use store-bought non-dairy milk here (any type: soy, almond, hemp, rice, etc.) in a pinch, or if you don’t feel like making the cashew milk. It won’t be quite as decadent, but it’ll still be delicious. As you’ll see, I grate fresh pear and ginger right into the muesli; I remember reading once that the enzymes in the fruit help to break down and soften the oats. I’ve no idea if this is true, but I love the way that the pear helps to sweeten the dish, and the fresh ginger gives it a great kick. To prepare the muesli, mix all muesli ingredients together in a mixing bowl. Add 1¾ cups cashew milk; alternatively, add 1¾ cups of a non dairy milk of choice. Stir to combine. Cover, and let sit overnight in the fridge. 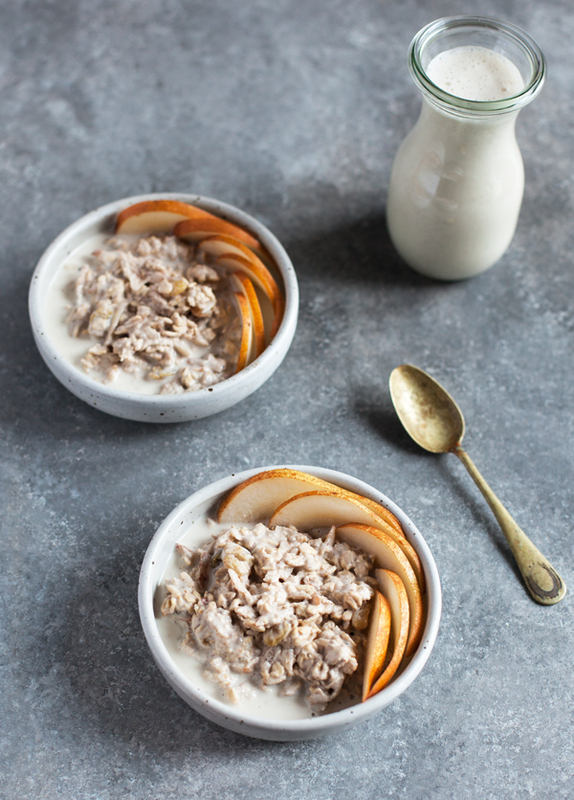 In the morning, scoop muesli into two bowls, pour some extra cashew milk (about ¼ or ⅓ cup) on top, and garnish with extra pear slices if desired. Serve. Leftover muesli will keep for up to 2 days. If you don’t have pears, apples will work nicely here, and you can absolutely play around with the additions. Many dried fruits would work (including dried apricots or cranberries, or chopped dates), and a small handful of nuts or seeds would give the dish nice texture contrast. Hope this lovely breakfast will help to start your morning off on a bright note, whether you make it after Thanksgiving or not. And speaking of Thanksgiving, I wish all of you who are celebrating a wonderful (and tasty!) holiday. I’ll see you on Friday for a fun new cookbook review and giveaway. Hi Gena–two words: yum. yum. This muesli looks so good! 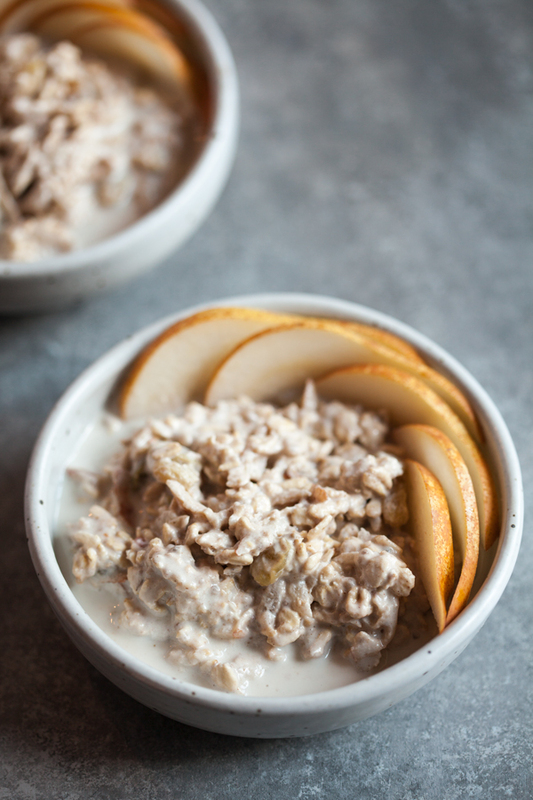 I’m a HUGE fan of overnight oats/muesli, and I’m loving the combination of ginger and pear. On a totally different note, I’m pretty jealous that you’ve been to Switzerland. That’s a country I’ve wanted to visit for years! It looks so good, Gena! I have never tried the combo of pear and ginger before but it sounds really good. & the cashew milk sounds really good too – it must taste so good with dates in it! I first experienced muesli in Europe too. It is the best! I am most definitely making this soon. 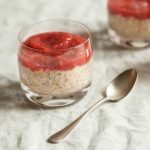 Move over overnight oats! What a lovely sounding breakfast. As much as I enjoy a nice, hot porridge in the morning as the days get colder, there are days where I just don’t have the time to make it. 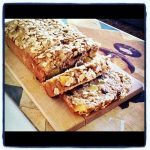 This sounds wonderful =) I have never made muesli and have all of the ingredients on hand to make this for breakfast! I’ve made it twice already, too. So glad you like! Gena, I’ve never made cashew milk before and finally did so to make this recipe. Wow. My life is changed now! 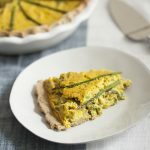 This is a delicious recipe and whenever I make it, I can’t wait to make it again!